Professional organizations. For special education teachers responsible for multiple subjects, choosing which organizations, if any, to join may be a difficult task. But these organizations can be a lifeline to content experts in a variety of content areas. When I was a teacher, math professional organizations were the best way for me to connect with people who had been living and breathing math much longer than I had, and at much more sophisticated levels. Networking is often mentioned as a major reason to join a professional organization, and this is certainly a significant benefit. Online resources available to “members only” is another benefit many organizations now offer. The National Council of Teachers of Mathematics (NCTM) offers their Illuminations website, filled with searchable lessons by topic and grade level, aligned to national standards, and supported by online tools such as applets and virtual manipulatives. The website also houses mobile games, interactives, and brain teasers. Teachers looking for engaging, differentiated instruction in mathematics should make Illuminations a first stop when looking for high quality lessons for any student. Within Illuminations is Dynamic Paper, where users customize graph paper and then print it out for students to use. Looking for a number line that goes from -8 to 8? Looking for polar coordinate graph paper? 6 part spinner? How about 2-dimensional nets of 3-dimensional shapes? Dynamic Paper supports evidence-based instruction such as the use of visual representations, and concrete-represenational-abstract (CRA) commonly used with students with disabilities and students who struggle by allowing any user to access needed materials. The Michigan Council of Teachers of Mathematics (MCTM) is an NCTM affiliate. In addition to public information such as conference announcements and links to statewide resources, the Members Only section of the MCTM website contains electronic issues of their journal, Mathematics in Michigan, their newsletter, MCTM Newsletter, and other classroom resources. MCTM publications provide scholarly and practical information on the latest research in mathematics education, updates on mathematics policy in Michigan, and announcements of math-related events around the state. 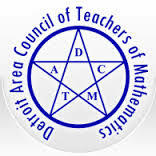 The Detroit Area Council of Teachers of Mathematics (DACTM) is also an NCTM affiliate and draws members from the southeastern part of the state. DACTM combines face-to-face professional and social events with online resources, such as their online publication The Factorial!, to encourage networking and professional learning among their membership. DACTM is always exploring ways to connect to members online, including hosting Twitter chats and posting videos from their conference. For some issues of Special Ed Tech, I use this column to feature technology for students, and for other issues, technology for teachers. Math professional organizations have a long history of providing valuable learning opportunities for their members. Times have changed, but the potential for improving teaching and learning through professional organizations has not. Special education teachers can access valuable content area resources across multiple subjects as professional organizations utilize technology to serve their members. Tagged CADTM, Detroit Area Council of Teachers of Mathematics, Dynamic Paper, graph paper, Kate Fanelli, MathTech, MCTM, Michigan Council of Teachers of Mathematics, National Council of Teachers of Mathematics, NCTM. Bookmark the permalink.